The new book series entitled 'Citizenship and Sustainability in Organizations' publishes excellent, innovative and critical scholarship in the fields of citizenship, social responsibility, sustainability, innovation, and place leadership in diverse organizational contexts. These contexts include commercial businesses, social enterprises, public service organizations, international organizations, faith-based organizations (FBOs), non-governmental organizations (NGOs), community groups, hybrids and cross-sector partnerships. The role of the individual as citizen may also be explored in relation to one or more of these contexts, as could formal or informal networks, clusters and organizational ecosystems. For the new book series, we will be commissioning editors and authors to contribute edited volumes, handbooks and monographs. Further details about the different book types that are acceptable within the series and proposal guidelines can be found here. Book proposals should propose core themes and emerging areas of research and thought leadership. The Series Editors, Dr David Murphy and Professor Alison Marshall (Institute for Leadership and Sustainability, University of Cumbria, Ambleside, UK), are currently accepting new book proposals. 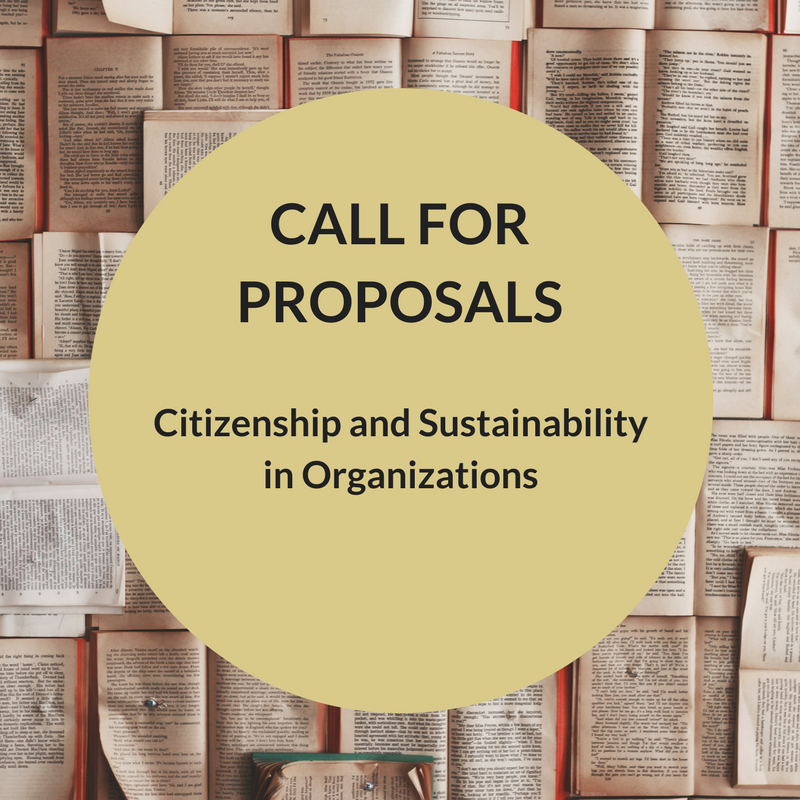 We are particularly interested in topics that integrate theory about citizenship and sustainability with leadership, management and collaboration in practice. 'Citizenship and Sustainability in Organizations' aims to publish the best ideas integrating a wide range of theory and practice under the broad umbrella of citizenship and sustainability in a format that is readable, accessible, engaging, interesting and useful for readers in academia, business, consultancy, government, the UN system, NGOs, community groups and related networks. A cover letter that explains the concept and aims of the proposed book. A description of the intended readership including discussion of: (a) whether the readership will be especially strong in any particular geographic area, (b) whether the book is useful to an academic or practitioner audience, (c) whether the book is intended as a textbook, and if so, at what level. A description of how the proposed volume differs from other books currently on the market, including a commentary on what other material has been published on this topic. A summary CV, including selected, relevant research, scholarship and publications. A detailed Table of Contents or, for an edited collection, a list of possible/probable contributors. An indication of the intended size of the book, either in pages or words. Several sample chapters including an introductory chapter. A proposed timeline, including likely completion date. Suggestions on how the book might be marketed (key audiences, networks that may be interested, potential course adoptions) and whether there are possibilities for bulk purchases by the author(s) or his or her organisation(s). We encourage proposals from academics, business practitioners, policy makers, community leaders, activists and individual citizens. Please do not hesitate to contact us if you need more specific guidance or would like to discuss a proposal. David F. Murphy is Deputy Director of the Institute for Leadership and Sustainability, University of Cumbria. He has worked in a variety of organisational settings, including academia, NGOs, business, the UN system, community networks and independent consultancy from global to local levels. He has extensive capacity development and applied research experience on sustainable development, corporate social responsibility (CSR), partnership working, multi-stakeholder collaboration, and related policy development and implementation in diverse organizational and sustainability contexts. Alison Marshall is Professor of Health Technology and Innovation, University of Cumbria. She has worked in business, academia and consultancy at the interface between innovators, users and organisations throughout her working life. She has interests in the development and adoption of technology, supporting innovation and user engagement, at an individual, organisational and regional level. Recent work has focussed on the distinctiveness of rural contexts, particularly how collaboration and partnerships develop to foster innovation and growth. A leading publisher in the areas of responsible management, ethics and social responsibility.